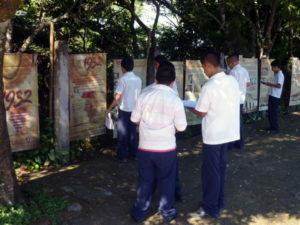 Museo de la Palabra y la Imagen, a citizen initiative founded after El Salvador’s Peace Accord, preserves significant records on Salvadoran history and culture. The museum organizes exhibitions and publishes books and audio-visual documentaries on historical memory and human rights. Museo de la Palabra y la Imagen is dedicated to preserving the memory of the massacres carried out by authoritarian regimes, like the massacre of 1932 against indigenous communities and the murder of peasants in El Mozote in 1981. Along with other civil society organizations, the museum implemented the Monumento a las Vi­ctimas Civiles de Violaciones a los Derechos Humanos, honoring the victims of human rights violations.